If you’re experiencing breakouts, dryness, itchy skin, or any other skin care complication, the underlying cause of your skin irritation could be something that you didn’t expect—stress. Your mind, body, and emotions play an integral role in your skin’s overall appearance and texture. In many cases, this can unfortunately result in undesired—and potentially embarrassing—blemishes and reactions. So, what can you do to reverse these stress-induced symptoms? Here, we’re covering everything you need to know about this topic such as the chemical process of stress, the impact of stress, and the skin care solutions we provide that’ll work to reverse your stress-related symptoms. The root of your stress-induced bumps, redness, and rashes extends far beneath the surface of your skin. In fact, these imperfections are caused by hormones, neurotransmitters, and other elements deep within your body. When your body physically reacts to stress, it begins with your adrenal glands. Your adrenal glands are small, walnut-sized glands that are located at the top of your kidneys. When you begin to experience a stressful situation, your adrenal glands receive distress messages from your brain. Once this happens, your body releases various hormones—such as adrenaline, cortisol, and norepinephrine—which cause the physical signs of stress to occur. Adrenaline, also known as epinephrine, causes what many refer to as a “fight or flight” response. A “fight or flight” response generates immediate stress-related symptoms such as racing thoughts, rapid heart rate, and muscle contractions. For example, think of a time when you immediately felt stressed. Maybe you just avoided an accident on the highway or received an urgent email from your boss minutes before your presentation. These types of situations induce adrenaline, which may cause your heart to race, palms to sweat, and an increase in breathing rate. Cortisol is another hormone that’s released when you’re in a stressful situation. However, contrary to adrenaline, cortisol affects the body in minutes rather than seconds. This is because the release of this hormone is a multi-step process. Cortisol is a hormone that largely contributes to skin reactions. When your body is in distress, it’s constantly releasing cortisol. Once cortisol is released, a chain reaction occurs in your skin. Meaning, perspiration can take place, your blood pressure can increase, and your immune system can suppress itself. These factors are continuous, and unfortunately, can cause a wide range of skin irritations. When your body releases norepinephrine, you become more responsive, aware, and alert. Additionally, this hormone can shift your blood flow to areas of your body that are under immediate impact of stress, such as your brain or internal organs. Unfortunately, by catering more towards areas of the body impacted by stress, norepinephrine can reduce blood flow to the skin, causing it to flare up and produce undesired bumps, blemishes, or rashes. When these stress-induced hormones are released, your body takes notice. And just as your body works to show signs of stress, it also works hard to counteract your stress-induced symptoms. In this section, we’ll go over how this process works in more detail. Understanding how your body calms itself down begins with understanding neurotransmitters. Neurotransmitters, known as chemical messengers, carry, boost, and modulate signals between neurons and other cells. Out of the 30 to 100 neurotransmitters in the body, there’s one called serotonin. Serotonin is your body’s best friend when it comes to stressful situations because it works to lessen your physical response to stress. After your adrenal glands receive a distress message from your brain, serotonin begins its role. Acting as a buffer against stress, serotonin gives your body a break and helps calm down the physical components of stress. While the inside of your body is dealing with adrenaline, cortisol, norepinephrine, and other various hormones, the outside of your body could be dealing with blemishes, rashes, and redness. This is because the chemicals produced by your body during stressful situations can cause your skin to become sensitive and reactive over time. Because every patient’s level of sensitivity differs, the impact of stress on your skin differs as well. For example, if you’re prone to breakouts, stressful situations may cause redness and acne. If you’re susceptible to eczema, you may notice your symptoms start flaring up around stressful events. And unfortunately, even if your skin is typically clean and clear, stressful situations can bring skin reactions that you haven’t yet been exposed to. This is because the impact stress has over your skin is oftentimes unpredictable. But don’t worry. Although these skin reactions seem harsh, many of these conditions are normal and are usually expected when you’re stressed. Your mind and emotions have a powerful effect on your skin and these reactions are just your body’s way of responding to the stressful events. 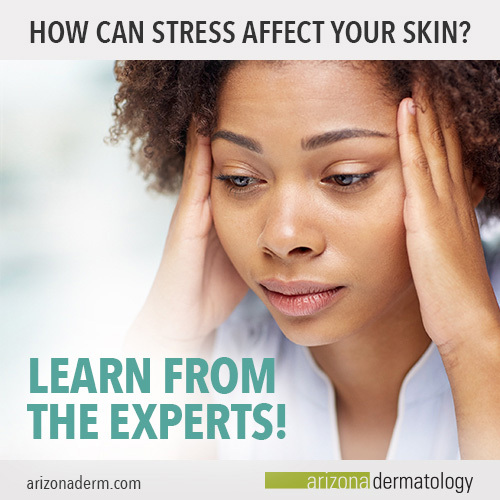 You may be asking yourself, “How can I counteract these symptoms?” At Arizona Dermatology, we recommend patients handle stress-induced skin irritations by reducing the impact stress has over your life and counteracting your pre-existing skin conditions. The first suggestion we give our patients is to try to reduce the impact stress has over your life. By reducing the power stress has over your body, you can lessen your skin irritations and live a much healthier and happier life. Although these suggestions seem intuitively obvious, they can have a huge impact on your life by changing the way you react to stressful situations, both mentally and physically. Our next suggestion is for patients who already see the impact stress has over their skin. If this sounds like you, know that we provide solutions to counteract even your most frustrating skin care problems. At Arizona Dermatology, we provide a wide range of treatment options that will improve your stress-induced skin irritations and reduce the effect these symptoms have on your skin over time, such as acne scarring. For more information on any of these treatment modalities, feel free to contact us. As industry experts, we’ll help you determine which treatment is right for your skin care needs.